1 Co-official with Faroese in the Faroe Islands. German is recognised as a protected minority language in the South Jutland (Sønderjylland) area of Denmark. 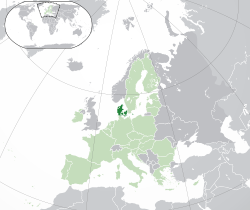 Danish is recognised as a protected minority language in the Schleswig-Holstein region of Germany. 2For Denmark excluding the Faroe Islands and Greenland. 3 The TLD .eu is shared with other European Union countries. Даньско (Danmark) — країна в Европі. Мать 5,7 міл. жытелів і розлогу 42,925.46 km2 (без Ґроньска і Фаєрьскых островів) Од року 1973 Даньско є членом Европской Унії. Головне місто Даньска є Кодань. В Даньску є офіціална мена Даньску коруна (DKK). ↑ Kongehuset (по Danish). http://www.kongehuset.dk/publish.php?dogtag=k_dk_familien_dronningen. Одказ перевіреный 29 November 2010. ↑ Immigrants and their descendants and foreign nationals. Statistics Denmark. Dst.dk. 12 May 2010. http://www.dst.dk/HomeUK/Statistics/focus_on/focus_on_show.aspx?sci=565. Одказ перевіреный 31 July 2010. ↑ Population by region and time. Statistics Denmark. 1 October 2010. http://www.dst.dk/HomeUK/Statistics/Key_indicators/Population/pop.aspx. Одказ перевіреный 11 November 2010. ↑ 4,0 4,1 4,2 4,3 Denmark. International Monetary Fund. http://www.imf.org/external/pubs/ft/weo/2010/01/weodata/weorept.aspx?sy=2007&ey=2010&scsm=1&ssd=1&sort=country&ds=.&br=1&c=128&s=NGDPD,NGDPDPC,PPPGDP,PPPPC,LP&grp=0&a=&pr.x=39&pr.y=4. Одказ перевіреный 31 July 2010. ↑ Human Development Report 2010. United Nations. 2010. http://hdr.undp.org/en/media/HDR_2010_EN_Table1.pdf. Одказ перевіреный 5 November 2010. Послїдня зміна той сторінкы: 21:22, 10 октобра 2018.